John Sayles latest movie portraying 1950s blues of the rural Deep South was mostly overlooked in theaters this past winter. 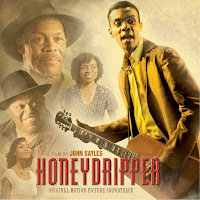 But on February 5th, Rhino Records released the soundtrack for Honeydripper and if you're a fan of old-time R&B, you might want to check it out. The 15 track album features three tunes by guitar phenom Gary Clark, Jr.--who makes his acting debut in the film. Also included is Goin' Down Slow--a jazzy, bluesy number performed by the film's star Danny Glover. The eclectic mix of music on the album consists of familiar classics such as Move It On Over performed by the legendary Hank Williams (with echoes of the future Rock Around the Clock by Bill Haley and the Comets...) and Why Don't You Do Right as interpreted by Lil Green as well as the gospel-tinged Standing by the Highway and You Got to Choose sung by the New Beginnings Ministry and soulful blues harmonica on Stack of Lee by Keb' Mo'. American music has always had the ability to absorb and transform different traditions, to dig into the past and deal with the present, to constantly reinvent itself. Honeydripper is set at a musical crossroads, 1950, in the semi-mythic town of Harmony, Alabama. A peek at a jukebox menu from that time and place reveals a rich mixture of blues, swing, R&B, gospel, country & western, pop ballads, and something that in a few years would be labeled rock 'n' roll. That rich mixture of musical traditions can be found on the Honeydripper soundtrack as well.